In this 2012 Sports Illustrated story, S.L. 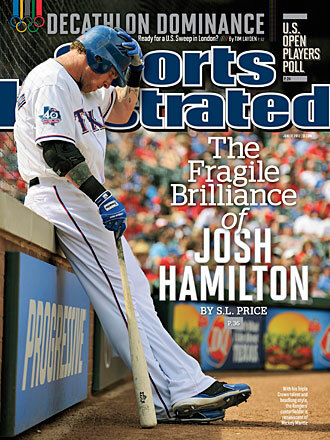 Price reports on how Josh Hamilton is wrestling with his present success and future plans. This story originally appeared in the June 11, 2012 issue of Sports Illustrated. 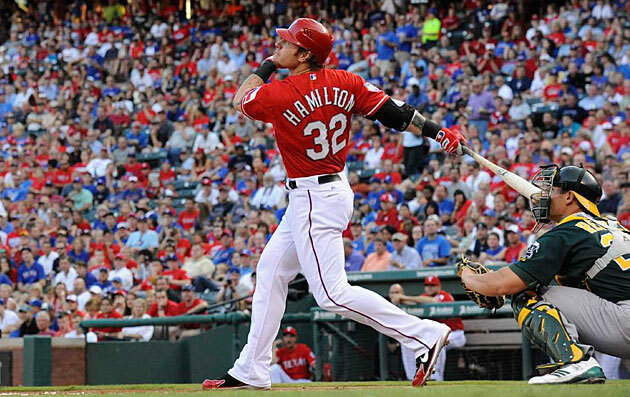 Josh Hamilton has outsized talents and grand plans for the free-agent windfall coming his way. But the Rangers' centerfielder also feels pressure to be larger than life. Through his faith, his family and a more studious approach to the game, he's learning bigger isn't always better. The way it starts, Ron Washington will see a sleeve, a flash of eye, a sliver of Josh Hamilton flit past the doorway of his office. This will be hours before game time, the Rangers manager talking with a coach, maybe a reporter. He'll keep chatting, but with antennae up now, waiting to see if Hamilton comes back. Because the man lurks when it matters. Minutes will pass, and he'll drift again by the door, hover, and Washington will stop his conversation cold. "What's up, 'Bone?" Washington will call out, and if Hamilton steps in, Washington tells his guest to go. His All-Star outfielder doesn't rest much, when a day game follows a night, and it's when he's tired that his face grows paler, more lined, haunted. Hamilton is 31. When he lurks, he looks older. You can see all the mileage. "Sometimes he can't sleep at night," Washington says. "This is when the demons start to come out of him, and he needs someone to talk to." Both men know the cost of a bad hunger. Washington, at 57, nearly lost his job after testing positive for cocaine during the 2009 season;Hamilton famously lost five years of his career to booze, powder and crack. Together, they've put much of that behind them. The Rangers are coming off back-to-back World Series appearances and own the best record in the American League. Hamilton is having the dream season that baseball men, sure they had seen the next Mantle, predicted well over a decade ago. Washington will shut his office door. They'll talk then about temptation, the game, people, what it means to be a man, with Hamilton flipping through his Bible for a relevant verse. "He finds it," Washington says with a snap of his fingers, "like that." Washington is in his office now, hours before another game, door closed. You can hear no banter, no spikes clacking, nothing from the halls and clubhouse beyond. People have been asking him all season about Hamilton's heroics. The four home runs in Baltimore. The night he ravaged the centerfield wall running down a ball in Seattle. His sick at bat in the 13th inning against the Jays in steamy Arlington, Hamilton drained by respiratory and sinus infections, seeing stars, sucking oxygen between innings. He hit the walk-off homer, of course. That's the easy part. It's stillness that's hard. "Sometimes it takes 20 minutes up in here, and sometimes we take a half an hour," Washington says. "Then he leaves, and I'm cleansed and he's cleansed." I'm convinced that Josh Hamilton IS God! It keeps getting bigger, doesn't it? This whole Josh Hamilton ... what? Situation? Dynamic? Phenomenon? Since he finally arrived in the big leagues five years ago he has been a package of such outsized talent and heartbreak, such staggering risk and reward, that the usual terms hardly did it justice. So what to call it now? This latest iteration—the Triple Crown numbers, the new cycle of relapse and redemption, the looming high-stakes contract when his current deal expires after this season—has expanded the whole Josh Hamilton thing to near-mythic proportions. Even the most hard-bitten baseball man, one who made his name striking out thousands and never, ever, backing off from a challenge, can't help but perform a purse-lipped version of genuflection. "Would I pitch to him? I would not pitch to him in the strike zone," says Rangers CEO Nolan Ryan, who blew it past Hank Aaron and Reggie Jackson and Barry Bonds. "He would have to beat me on a ball out of the zone—and I'm not talking about an inch or two out." Ryan's standard is Willie Mays, who went 0 for 3 against him but put the ball in play each time. Mays also happens to be one of the 13 men, aside from Hamilton, to homer four times in a game in the modern era. "Have I seen somebody that can take a ball club night in and night out and carry 'em like Josh can?" he says. "Nobody comes to mind, no." Adrian Beltre knows hot. In 2004 he had one of the best seasons ever by a third baseman, hitting .334 with 48 home runs and 121 RBIs. Last year he hit 12 home runs in September. Last October he hit three homers in a playoff game. But well after Hamilton's epic seven days in May, when he hit .467 with nine homers, 43 total bases and 18 RBIs, Beltre was still stunned at what his teammate can do. He has never felt anything like Hamilton's hot. "What he's doing is incredible," Beltre says. "Hot, man, is when you hit .350 for a month, .350 for a week—not .450 with, like, 10 home runs in a week. I can't do that. I have abilities—but not like that." Hear that tone? Players still speak of Bonds with respect and fear, but this is different. This is a child's awe. "Siri," A's pitcher Brandon McCarthy tweeted in May, "how do you get Josh Hamilton out?" You have to go back to the 1980s, when Bo Jackson was crashing howitzer home runs and snapping bats over his knee, to recall a chorus quite so breathless. You couldn't be blamed for thinking you'd never hear it again. Josh Hamilton's five-tool skills have always inspired awe, but his performances in 2012 had some fellow players wondering if he was divine. Baseball, after all, was supposed to be beyond wonder by now. Pinched for two decades between the Steroid Era and Moneyball's reduction of passion and craft to holy math, the game's romance could barely breathe. Narrative ("My newfound power? I hit the gym hard in the off-season....") lost all credibility, and Hall of Famers were downsized to fantasy-league pawns. Roy Hobbs was all but dead. Of course, the big irony of the Hamilton thing is that, just this past January, the same aw-shucks star now ringing up fan votes for what seems sure to be a fifth straight All-Star Game start again broke sobriety with drinks at a Dallas bar. The Rangers decided to delay free-agent negotiations. Hamilton apologized to family and team, and asked the public to pray for him. Then he embarked on the most explosive start—.402 with 18 home runs and 41 RBIs in his first 31 games—by a hitter since the Athletics' Jimmie Foxx in 1932. He has slowed a bit since: Through Sunday, Hamilton was hitting .354 and leading the majors in homers (21), RBIs (57), OPS (1.138), total bases (142) and slugging percentage (.728). At this rate he'll just end up hitting 63 homers and driving in 171 runs, while leading all athletes—ever—in embarrassments survived. It's all out there to read or see: Hamilton's oft-repeated accounts of a coke habit so gripping that he once eagerly blew eight-inch gobs of sinus tissue out his nose in order to do more; photos of an alcohol relapse from 2009, featuring his shirtless torso, whipped cream and a stranger's breasts. At his mea culpa press conference after this year's relapse, Hamilton described himself, when he drinks, as being "very deceptive, very sneaky." He will tell anyone who asks how bad he is, and how much he wants to be better. Yes, opposing fans will be screaming "Crackhead!" or "Have a drink on me" until the day Hamilton retires. But the general public's attitude has been markedly sympathetic—"shockingly so," says Rangers general manager Jon Daniels. Hamilton's jersey ranked fourth in nationwide sales in 2011, and kids, with their parents, still form up in long lines to meet him. After decades of secret pills, creams and injections, of finger-wagging denial and disgrace, there must be something refreshing about a player who admits it all. "Josh owns up to it," says Royals outfielder Jeff Francoeur, a former teammate. "You see a lot of people deal with personal issues, they hide behind it. Josh is very up front and people appreciate that. They know he's a real person." Then Francoeur takes it a step further. "That's a guy I'd want all my kids growing up and saying, 'That's my role model,'" he says. "Do I want them doing the things he did early? No. But the way he goes about his faith, the way he's outspoken, it's good to see good things happen to good people. And Josh is a good guy." That's another of Hamilton's great gifts. Everyone says so. Meet him once, and you'll forgive him just about anything. It's the simplest of prayers, as old as the first mother. "God," Katie Hamilton begged over and over, "Just please protect my kids, please protect my kids, please...."
She and Josh have four daughters, ages nine months to 11 years. When, in early February, the story about her husband's latest relapse broke, complete with sniggering Web chatter, the thought of sending the girls to school alarmed Katie. What defense is there for playground nastiness? But in the middle of Please protect my ..., she heard another voice break in. They're my kids, it said. "Oh ... yes," Katie recalls thinking. "They are. They're His kids, and I just have to trust Him. He calmed my heart in that." Her children, she says, have yet to hear one cruel word on the matter. Like Josh, Katie considers herself a born-again Christian with a one-on-one relationship with Jesus that involves a near-constant interior dialogue. For example, Hamilton claims the Holy Spirit told him, as he walked to the plate in the 10th inning of Game 6 of the 2011 World Series, that he would hit a home run. He did, a dramatic two-run shot that gave Texas the lead, but the Rangers ended up losing to the Cardinals in 11. "There was a period at the end of that," Hamilton explained after. "He didn't say, 'You're going to hit it and you're going to win.'" Josh says he's been hearing the voice since he was about seven. "It's just like talking to a friend," he says. "But most of the time, when I stop talking is when I hear from Him. It's just the coolest thing that you can imagine." He and Katie credit faith with saving Josh's life, saving their marriage, saving his body and talent for the moment when he could be strong enough, in 2006, to return to baseball. The fact that man and family remain intact is considered a miracle by believers and nonbelievers alike. Many times, Katie wanted out. They became a couple in 2004, when Hamilton was still slogging around Raleigh, his hometown, neck-deep in his addiction. He had burned through much of the $3.96 million signing bonus that the Devil Rays gave him in 1999 and was in the second year of a three-year stint on baseball's restricted list. He relapsed two months after their November '04 wedding, and in August '05 he bartered her wedding ring for cocaine. When, later that month, they had their first daughter together (their oldest, Julia, is hers from a previous relationship), Katie was sure the responsibility would prove transforming. Three days after Katie gave birth, Josh left to pick up a prescription for her and ended up in a bar. Not long after, he began smoking crack. "I was kind of out of ideas," Katie says. They separated soon after, she took out a restraining order, but "I didn't ever feel freedom to get divorced. I knew that we were supposed to be separated so we were safe, me and the kids, but He had not released me from our marriage. God just kept telling me to wait. So I did." In October 2005, after he bottomed out at his grandmother's home, Josh gave his life over to Christ. Katie forgave him everything, if only to stop the bitterness, but trusted nothing; they stayed apart for the next six months. Josh moved to a Christian-based baseball academy called the Winning Inning in Clearwater, Fla., slept upstairs on an air mattress at Jack Russell Stadium, cleaned toilets, raked dirt. By June '06 he had been sober for eight months and the family had been back under the same roof for two. Major League Baseball declared him, after eight rehab stints and a three-year absence, eligible to play. Hamilton worked hard at not taking for granted his true home team: Katie (in black) and (from left) daughters Julia, Sierra and Michaela. On the field Hamilton's path has been the stuff of born-again lore. In 2007, after fewer than 100 career at bats in Double A, Hamilton made the Reds' Opening Day roster and smacked a homer for his first big league hit. In '08, after being traded to Texas, he headed into the All-Star break with 95 RBIs, then lit up Yankee Stadium with a 28-bomb barrage during the first round of the Home Run Derby. Time and again he made bone-rattling catches, battling near-constant injury; in '10 he hit .359 and was named AL MVP despite missing the season's last month after bruising his ribs in yet another collision with an outfield wall. A few days before the '10 ALCS against the Yankees, he heard God rightly predict that he would hit a home run in the first inning of the first game off CC Sabathia. His autobiography, a New York Times best seller, was called Beyond Belief. That seemed about right. People haven't been shy about comparing him with the best the game has ever seen. "Josh has more talent, Barry Bonds had more discipline," Washington says. "I don't think Josh would ever get to the discipline that Barry finally got to, but I've never seen a talent like him. He can run, field, throw, hit, hit with power. Barry had all that, but as Barry got older his speed disappeared. The arm disappeared. Hamilton has it all." Still, discipline isn't just a missing baseball tool. It's the key to Hamilton's survival. He can feel when his faith, his will, begins to fray; the month before that half-naked relapse in a Tempe bar in January 2009, he found himself closing down around family and friends. He stopped praying. "There's this slow fade that leads up to it," he says. Hamilton confessed, in tears, to Katie the next morning, and soon after to Rangers management and Major League Baseball, but it took seven months for the story and photos to go public. Damage control involved a shoring up of his support system (Johnny Narron, then a Rangers special-assignment coach and Hamilton's full-time minder, or "accountability partner," again took full control of his pocket money), but he and his family treated the relapse less as a disturbing sign than a freak event. "It was like, O.K., it's over, done with," Josh says. "Put it behind me." Last November, Narron, after five years by Hamilton's side almost day and night, left the Rangers to join his brother, Jerry, on the Brewers' coaching staff. The Rangers offered the minder job to Katie's father, a motivational Christian speaker named Michael Dean (Big Daddy) Chadwick, who had supported Josh during some of his darkest moments in North Carolina. He turned it down in January to stay home with his 17-year-old daughter. Hamilton felt another slow fade coming. On the night of Jan. 30 he went out to dinner alone at a Buca di Beppo in North Dallas, and he began ordering drinks. Teammate Ian Kinsler soon joined him, but Hamilton didn't reveal he was imbibing. "That's where that con man comes out," Hamilton says. "I didn't drink out of beer bottles or anything like that. I put it in a Styrofoam cup with a lid and a straw. I know that side of me. I don't like that side of me. But it's fact that it's there." Hamilton says he had three or four drinks; then, with the restaurant closing, Kinsler drove them to a nearby bar and grill, where they stayed for about a half hour. As Kinsler was dropping Hamilton back at his car, he sensed something awry and asked if he planned on going back out. "No," Hamilton responded. "I'm good." Kinsler left. Josh went back to the bar and drank more. Anonymous witnesses soon related accounts online of raucous doings in a bathroom.Hamilton never publicly addressed those rumors, saying only at his press conference, "Things happened that me, personally, I'm not proud of after I drank, and they are personal and being handled as that." As his buzz kicked in, Hamilton didn't consider the fact that he, one of America's most famous substance abusers, was abusing in a public place. Again. "You know how, when you first start doing it, the switch flips to get there?" he says. "When you're in it, the switch flips again and you're like, What the crap? Why am I here? How did I get here? I can't believe I'm doing this again...."
He thought he could keep the con going later that night, when he returned to his home in Westlake. He deflected Katie's questions, but "I can tell," she says. "I can always tell." The next morning Hamilton fessed up. Even after all their history, she was stunned. "It's just so hard for me to wrap my mind around," Katie says. "That's how I know that he's totally not thinking [during a relapse]. Because he's smarter than that. "That's not to say that I was any less irate. People that don't know me probably think I have some kind of codependence issue, like I get my value in helping him. Absolutely not. I fully expect him to be the man and husband that God has called him to be. I should never have to assist him in this. I do assist when God has allowed me to, but I did not assist him—not one bit—this last relapse. I let my husband man up and assist me. I let him do what he was supposed to do." 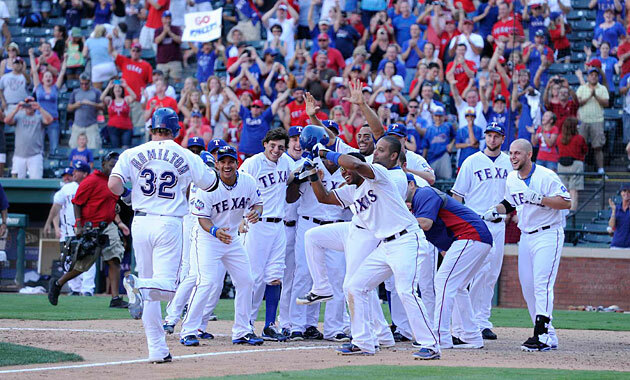 With Hamilton leading the way, the Rangers reached the playoffs three straight years from 2010-12. There was a time, not long ago, when Josh Hamilton didn't know what he was doing on a baseball field. This hit Rangers coach Gary Pettis one night early in 2008, during Hamilton's first season as an everyday player, as Pettis watched him race across the Metrodome in Minneapolis for a line drive. Hamilton misjudged everything: his jump, his route, the ball coming fast out of the lights. It flew right past him. When Hamilton jogged in at the end of the inning, Pettis met him at the dugout's top step. "You got to catch that ball," he said. "Keep doing that, and you'll cost us a game." "Well," Hamilton replied, "I tried ..."
"You tried?" Pettis snapped. "I can get somebody out of the f------ stands to try! This is the major leagues: You got to do it!" By then Hamilton had broken to a start nearly as impressive as this year's. In August 2008 he became the first American League player in 107 years to be intentionally walked with the bases loaded; in all he drove in 130 runs in 156 games. His name would've been in the Rangers' lineup every day if Hamilton had decided to play outfield blindfolded. "Yes, and no one'd notice," Washington says. "So he overthrows the cutoff man? No big deal. "He just never knew what work ethic was. He never knew how to work. It was all talent." Temperament, too. Hamilton had never been a grinder, a baseball wonk. He loved the game's glory moments, its movie version—big hits, crowd screaming—and his gifts were so deep that even mistakes could make him a hero. "He didn't love baseball. He loved to hit," says Roy Silver, who runs the Winning Inning baseball academy. "He loved to dive for balls. The third fungo I hit him, he dove for it and got up and pumped his fist and cheered for himself. But he wouldn't go upstairs and watch baseball. He would go upstairs and watch cartoons or play a video game." During spring training in 2009, Pettis made Hamilton his main project. Because he'd spent relatively little time in the minors, Hamilton learned on the job, in real time, all that he had missed: how to study tendencies, how to stay in the game defensively even when his bat goes quiet—in essence, how to be a professional. "It's been a process," Pettis says. "Josh is 100 percent better today than he was when we acquired him. Especially mentally, he understands how this game is played." Such words will no doubt make Hamilton happy. He likes pleasing people. This endears him to fans and media, but it can be toxic: The same impulse to give an autograph-seeking boy a bonus pat on the head made him need approval from the dregs who offered up his first line of coke—not to mention the new pals he met during the relapses in Tempe and Dallas. It's why Hamilton has always tried to put on a show in batting practice. He needs a crowd's Whoa!s like a puppy needs petting. Those displays ease some of the pressure he feels to live up to his billing, to be larger than life, to justify that whole Josh Hamilton thing. Problem is, a hitter's stroke breaks down when he tries to do too much, to get what coaches call "big"—opening up the hips too soon, collapsing the backside, picking up the head. And more than most, Hamilton can get seduced by how far a useless BP shot will fly. "If I can just figure out ways to get a handle on that by taking the big picture—seeing where the ball goes, where it lands—out of it, then I'm going to be better during the game," Hamilton says. "We don't get paid to be good in practice. We get paid to be good in the game." This is why the route to his four-homer game is just as significant as the result. Because the day before, May 7, Hamilton took batting practice at Camden Yards, lost his swing and then went hitless through his first five plate appearances. "And I was huge!" Hamilton says, bringing his hands, slow-motion, through an imaginary zone and finishing up with the sloppiest swing you ever saw. "I was, Agggggghh!" For his last at bat that night, Hamilton focused, tightened his swing—and cracked a home run. A light bulb went on. When Hamilton arrived at the ballpark on May 8, he told hitting coach Scott Coolbaugh that he wanted to hit under the stands, in the batting cage: No crowd, no Ooh!s, just the barrel and a ball pelted, over and over, dully into a net. Coolbaugh blinked. Hamilton had skipped BP before because of fatigue, but never technique. For the first time, he wanted to get small. "Then he took it into the game and hit a first-pitch curveball out of the ballpark to centerfield," Coolbaugh says. "And you knew something special was going to happen." Hamilton hit his next one to left, then two more to centerfield, and tacked on a double to set an American League record with 18 total bases. Yet Camden Yards was nearly empty that night, only 11,263 Orioles fans there, and the blasts were met with near silence. When Hamilton trotted out to play the field, though, it was different. With small crowds Hamilton can hear every taunt leveled at him about his kids, his grandma, his wife, his drugs. For five years, he felt them dig under his skin. "You just got to stand there and wear it," he says. In April, though, Hamilton was standing in leftfield in Minneapolis during a game, worrying it again, when the Holy Spirit asked him a question. What did Christ do to those who persecuted him? "And I said, 'Well, he prayed for 'em,'" Hamilton says. "And it just changed the way I looked at all of it. I did a 180 flip." That's why now, if you watch out in the field, you'll sometimes see Hamilton's lips moving between pitches. He heard what you said. He's praying that you'll get better soon. Addiction, like talent, is a mystery. The parents, wives, friends and children of users can spend a lifetime obsessing about the disaster in their midst, its cause and effect, and even if all concede chemical dependence, you'll still hear debates about the choices made. Hamilton's struggle these days seems to be mostly with alcohol; there's never been a positive result on his thrice-weekly drug tests. But his last two relapses were also jarringly social. He didn't buy a bottle and slip alone into some basement. Both times, before any booze entered his bloodstream, he found places with music, noise, people laughing. He went to find a party. Part of Hamilton's mystery is a sense that being cheered 81 nights a year by 40,000 devotees isn't enough of a thrill. "There's this side of Joshthat's like just anybody else: What am I missing out on?" Roy Silver says. "But those days are gone. There're certain things I did when I was 20 that I'm not doing at 49." But the barroom drunk turns back time. For a few hours, liquor can make the four kids at home, the errands, the everyday grind that can make life seem small fade away. Doesn't liquor make you feel funnier, make people like you more, make even a ordinary dull night feel huge? Sure, you can say or do something stupid; sometimes you swing and go Aggghhh. But everyone's so happy. And what with cellphone cameras and the Web, humiliation is all but assured. "I want to get caught," Hamilton says. "Because I don't want to do it. I know it's not good for me; I know I don't act the way I'm supposed to act [when drinking]. There's nothing good that comes from it. Obviously I don't ever want to get to that point again. And I want the red flashing light to go off before it comes close to that point of happening. So it's a blessing in disguise that I was out in the middle of everybody." Katie wasn't at Josh's side for his apology press conference in February. Unlike the aftermath of his previous relapse in '09, she felt it was time to do more than just react. "It was so bizarre, and nothing about it made any sense," she says. "So we knew: There is something that we have missed. We have not gotten down to the core." Within days of Josh's January's binge, the Rangers finished their search for a new accountability partner—Shayne Kelley, a former football chaplain at Alabama, on the recommendation of Hamilton's agent, Mike Moye. The Hamiltons leaned heavily on a network of older mentors like their pastor, Robert Morris, of Gateway Church near their home, and the televangelist James Robison, who says that the couple's "zeal for God, their childlike teachability, blesses me." Josh also began counseling sessions, alone and with Katie, and took up intensive study at Gateway in its Freedom Ministry program. "And in less than a week I was looking at a completely different man—and I still am," Katie says. "There's work to be done, but the fruit that has come from it has overwhelmed me. It has been so good, and I'm so thankful that God gave me the grace and patience to stick around. "Every time Josh has had a relapse, it's what the enemy has used to mess us up, destroy our lives, destroy our marriage, destroy our testimony—and it's the very thing that has catapulted me and Josh even more in love with Jesus. I don't understand why the devil keeps trying it. It's not working at all. I'd have thought he got the memo by now." Even on his best days, Hamilton says, he tended to shut down after returning home, wearied from being "on" with fans, coaches and reporters. As the day got quieter, so did he; Hamilton worked to please strangers and took his family for granted. Now, "I'm taking control and telling people who love me what I'm thinking—not hiding," he says. "Telling 'em what's going on in my head right now, so they can help me with it." He's still digging deep at Gateway: into his childhood, the way he was raised. The inquiry may never end. "It's all a learning process, man. It's life," Hamilton says. "But I don't think I'd be at peace right now and able to do the things I do on the field if I was still searching for why this keeps happening. God's showed me things to help me get peace and not feel like this is something that's going to be with me forever." Hamilton has always been good at telling people what they want to hear. Silver knows. When Josh came to his academy in Clearwater in 2006,Hamilton was separated from his kids and his marriage was still fragile. Silver had to call him out at least once, confiscating Josh's keys and wallet. Pro ball wasn't an option: Silver's big idea then was to travel the country, showing Josh off as a cautionary tale. After January's relapse, Silver wanted to look Hamilton in the eye. He flew out to Arizona for a few days during spring training. "Is this worth doing anymore?" Silver asked him. "Can you do this baseball thing and still stay right?" Before dinner one night, they all drove to a nearby field—Josh and Katie and the three oldest girls, 11-year-old Julia, six-year-old Sierra and Michaela, 3. Josh threw batting practice to the girls, softly, pitch after pitch. Silver shagged balls. He didn't feel a con. Man and family seemed something close to whole. "To me, that was always the goal," Silver says. "That's more important than any home run he'll ever hit on television." On May 16, hours before the Rangers' 38th game of the season, Hamilton squinted through the Texas sunlight and recognized an elderly woman standing a half-dozen rows up behind the first base line. He waved her down, and once she made her way he hugged her tight. "How's my buddy doing?" Hamilton asked. Last July, early in a game against the A's, the woman's son-in-law, Brownwood, Texas, firefighter Shannon Stone, and six-year-old grandson, Cooper, were standing along the front edge of the leftfield bleachers when Hamilton fielded a foul ball. Hamilton is Cooper's favorite player. "Hey, Hamilton," someone shouted, "how about the next one?" When he turned, the first people Hamilton saw were Shannon and Cooper. Later in the game another foul ball came his way, and Hamiltontossed it toward them, a bit short and to the left. Stone reached, lost his balance on the railing. He fell headfirst, 20 feet onto the concrete below. He was heard asking for his boy before he was taken to the hospital, where he died shortly after. The next day Hamilton said the sound of Cooper's "screaming for his daddy" was what he'd remember most. On Sept. 30, Hamilton caught for Cooper when he made the ceremonial first pitch of the Rangers' postseason run, and he lingered longer than any Texas player when Cooper and his mom, Jenny, returned in April for the dedication of a statue of Shannon and Cooper outside The Ballpark in Arlington. Now Cooper's grandmother had come to show him a photo of that day. Hamilton stared at it and nodded and smiled, then used a pen to scribble something that took far longer than an autograph. They glanced at each other when he was done, then she walked back up the steps. He turned back to the ballfield, trying to keep another moment of ruin behind him. A dozen fans, cameras at the ready, stood waiting. Some have speculated that his random part in Stone's death, the horror caused by a kind gesture, somehow spurred Hamilton's relapse in January. "No, no, no," he says. "It was tough for the first three, four days, because I didn't understand how something so innocent could go so bad. But I couldn't live there. I prayed a lot about it, more for the family than I did for God to relieve me of anything. Feeling condemnation and guilt and things like that—it doesn't come from God." That he can distance himself is to the good. Hamilton has much to feel guilty about, and it's only healthy that his God can make him feel better about this one lightning bolt. Indeed, he has been granted a freer pass than most born-agains in the secular world, if only because addiction is so common and he's used his faith to condemn only himself. Besides, if this is the rope that he says pulled him out of the hole, who's really going to argue? Still, type in Hamilton's name on the Web and it won't take long to find someone declaring him a fraud. That comes with the territory, but the venom has spiked since he declared in spring training, on the eve of his walk year, "I don't feel like I owe the Rangers." His repeated statements that God will end up dictating where he plays next season make it easy to wonder if the Texas brass need worry more about Jehovah than Brian Cashman. But, actually, Hamilton's camp couldn't be more hard-eyed. "Fans and reporters are so far off base with where we are," Katie says. "They'll say, 'Oh, Josh doesn't care about the money.' No, we don't really care about the money so much for us, but we have huge plans for this money and, no, it's not strictly for our bank account. It is for a hurting world. The other thing they keep saying is, 'Josh needs Texas; he needs the comfort of this team.' Uh, we need Jesus. We need God. He goes with us wherever we are. Yes, we're comfortable in Texas. But maybe God hasn't called us to comfort. I mean, he didn't call Jesus to comfort." The couple say that this is what January's relapse changed most. Josh and Katie have had a foundation, Triple Play Ministries, since 2008; they've built an orphanage in Uganda and given funds for relief in Haiti. But Hamilton's immersion in his faith since has charged him to help on a far broader scale. Hamilton's injury history—not to mention uncertainty over how long his system, compromised by years of drug use, will hold up—make his worth harder than most to gauge. Long-term contracts for players in their 30s are inherently risky, and it's possible that Hamilton's body will get old faster than most. But no one would be stunned to see him fielding an offer worth anywhere from $175 million to $200 million next winter. AndHamilton hardly seems interested in giving Texas any kind of discount. He wants whatever the market will bear. "It's more the giving away part," he says. "That's in the forefront of any kind of thought we have about our next contract. The bigger it is, the more we can give away. It's cool to think about all the different ways you can help people by playing baseball. Who couldn't live on a million, two million, three million?" Whether he means for a year or a lifetime, Hamilton won't say. But call it payback or penance: This coming contract is a key reason, he feels, for why he was saved years ago. The whole Josh Hamilton thing was meant to serve as an example, a symbol to the masses of what faith can achieve. And he was meant to use his riches in ways that will be unveiled as soon as he signs on the dotted line. "We've prayed about it, and God's revealed a lot of stuff to us," Hamilton says. "Which is going to be shocking to the world when it happens. It's real big."